RXTX - Java Serial Communications Library. Serial communication schematic using a microcontroller to interact with the computer. RS-232 protocol. In order to get interaction between the contained world that is our application and the outside world that we want to control, for example in order for our application to control the movement and position of a motor, or in our case the turning on/off of a valve whenever there are leaks in the system. From design, Java lacks support for this kind of interaction as the language was originally planned to work in a contained environment (the Java virtual machine) and have no contact with the outside world. Luckily, design limitations have never been a problem for programmers and several libraries that grant communication between the application running in the JVM (Java Virtual Machine) and the outside world have been developed. Here, we'll deal with the RxTx library. Serial communication is a peer-to-peer communication protocol, and one of the simplest and more widespread in actuality given the low costs of this type of communication and the ease of use. 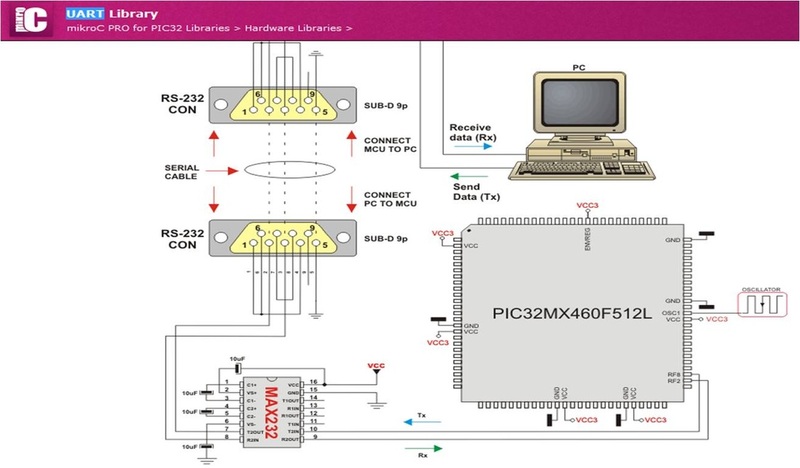 It makes use of the RS-232 protocol, which we won't deal with in this article, instead focusing on the programatically aspect of it, although for those looking for more information on this protocol, it can be seen in the Periphereal Programming course or the Industrial Networks one in the Mechatronics section. The serial port consists of sending 0's and 1's through a copper wire from an emitter and interpreting them in a receiver. In our case the emitter can be either the computer or the microcontroller. 1.-First of all, download the RxTx library from the official page, according to your Operative System. In our case I downloaded the rxtx 2.1-7r2 (stable) file from the webpage and located it in a special directory I use for my libraries and applications called "My Applications". 2.-After that, we decompress the file and put it in a folder we don't plan to move. In my case, its in Desktop -> Files -> My Applications. 4.-Once that is finished, we must include the libraries in our NetBeans IDE. To do that, we go to Tools -> Ant Variables and add a New Library. 5.-The new library must be given a name, in our case we call it RxTx and leave it as a Java Class. We press OK.
6.-Afterwards, we press the Add JAR/Folder button and go to the location where we placed our RxTx folder, and select the RxTx-commons file. Press OK.
7.-Finally we add the library to the project by making right click in the libraries menu on the Project menu at the top left of the NetBeans application. We select the Add Library and we'll get a menu enumerating all libraries available in the system. We select the RxTx previously defined and make click in OK. If everything has worked well, you'll get the following menu which when pressed should turn on and off the LED contained in the Arduino.